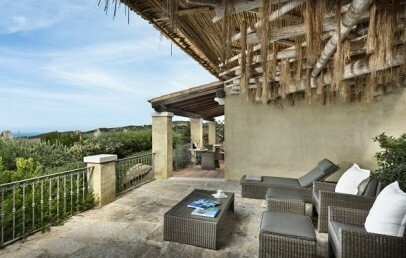 coastal resorts such as Cannigione and Porto Cervo. A jewel nestled between the granite mountains of Gallura and the blue of the sea, Li Finistreddi enjoys a quiet spot on top of a hill a short distance from the lively Costa Smeralda. Perfect for guests looking for a get-away, far removed from the frenzy of everyday life. The hotel is 6 km from Arzachena and 35 km from Olbia-Costa Smeralda airport. 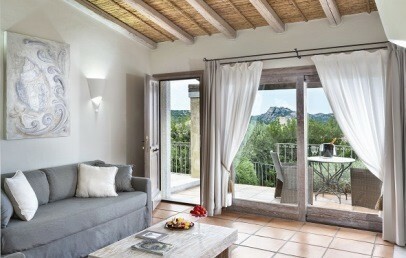 Set in a private 4-hectare park, Li Finistreddi has 19 rooms and offers an intimate and welcoming ambiance. A building full of rural charm in the heart of the Gallura region, with breath-taking views over the La Maddalena archipelago and the crystal-clear waters of the coast. The 19 rooms at Li Finistreddi are large and bright, decorated in light colours that provide a feeling of freshness and lightness. Double room – 14 rooms with external entrance, terrace and sea view or partial sea view. Deluxe Pool Suite – 2 rooms of 45 sq.m. with external entrance, heated pool in the private garden. Deluxe Suite Sea View – 2 suites of 45 sq.m. with external entrance. Bedroom, living room, large bathroom and outdoor space furnished with sun loungers. The closest beach to the hotel is Cannigione, just 3 km away. Other beautiful beaches along the Costa Smeralda are just a short distance away and are easily accessible by car. The newly built wellness centre offers two treatment booths, one of which is specially designed for couples massages; there is also a sauna, Turkish bath and an indoor salt-water pool with adjoining relaxation area and Jacuzzi. The 50 sqm fitness room fitted with Technogym equipment is available for guests’ use. Guests can also exercise outdoors on the running track in the private park that offers stunning views over the coast. The resort also boasts a flood-lit synthetic grass tennis court. Golf enthusiasts can head for the Pevero Golf Club, a mere 20 minute drive away. The hotel’s restaurant Osteria Gourmet has a following of enthusiasts who come to dine on a regular basis as the restaurant is also open to non-resident guests. The menu is constantly changing and evolving and has as its founding pillars a scrupulous selection of raw ingredients including both the best local and outstanding national products. The philosophy is to offer an experience of awakening and joy for the palette in an informal but refined, friendly and engaging setting, where guests can see first-hand meat, fish and vegetables being grilled and can round off their meal with a delicious home-made dessert. The lunch is served from 12:30 to 14:30 with a mini à la carte menu. The dinner is served from 19:30 to 22:30 à la carte with homemade pasta and pastries. The daily menu is based on seasonal products and possibility of grilled dishes. At the Wine & Cocktail Bar, guests can choose from an extensive wine list with wines also available by the glass, as well as cocktails and aperitifs, all in a comfortable and relaxing environment. Li Finistreddi is very proud both of its passion for cuisine as well as of the attention paid to wine: to finding high-quality wines carefully selected from local and national producers, supporting large brands and small producers, all with the aim of offering a constantly changing unique experience. Available to guests: two stunning pools surrounded by greenery with sun loungers – perfect for kicking back and relaxing. Free private parking. Complimentary Wi-Fi connetion available throughout. Double room located on the ground floor with external entrance directly from the garden. 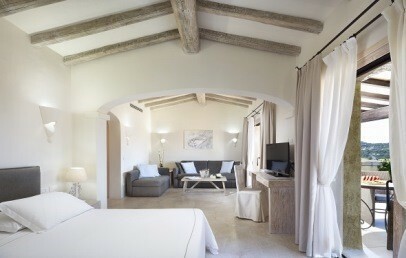 Double rooms are decorated in traditional Gallurese style – simple and comfortable. The rooms offer a large wardrobe, desk and private furnished terrace with partial sea view. Connecting rooms available. Comfortable suites (Mirto and Rosa) with private entrance. 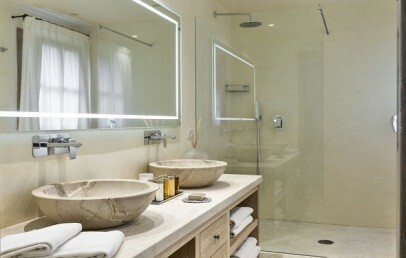 The suites offer a bedroom and a large living area, en-suite bathroom with shower. Large outdoor area with partial sea view patio, furnished with sun loungers, where guests can dine and relax outside. Private garden with heated private pool. Comfortable suites with external entrance. 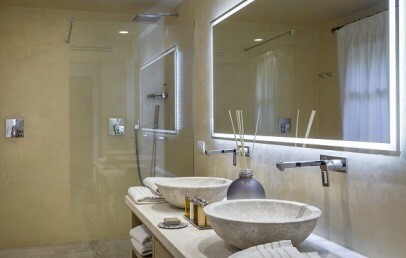 The suites offer a bedroom with 2 m long double bed, large living area, en-suite bathroom with shower and double sink. Large outdoor space furnished with sun loungers where guests can dine and relax outside. The living area can accommodate two additional guests. Double room located on the ground floor with external entrance directly from the garden. 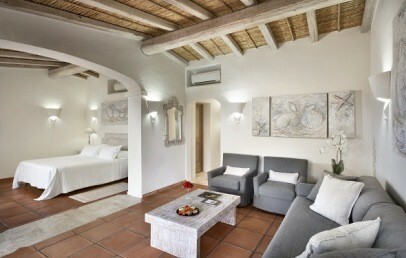 Double rooms are decorated in traditional Gallurese style – simple and comfortable. The rooms offer a large wardrobe, desk and private furnished terrace with sea view. Connecting rooms available. Exclusive Suite with private entrance. 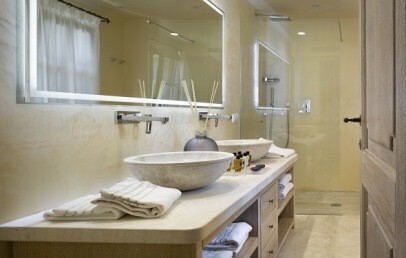 The suite offers a bedroom and a large living area, en-suite bathroom with shower. Large outdoor area with panoramic sea view patio, furnished with sun loungers, where guests can dine and relax outside. Private garden with heated private pool. Only for our customers who book a Suite: a bottle of prosecco in the room!